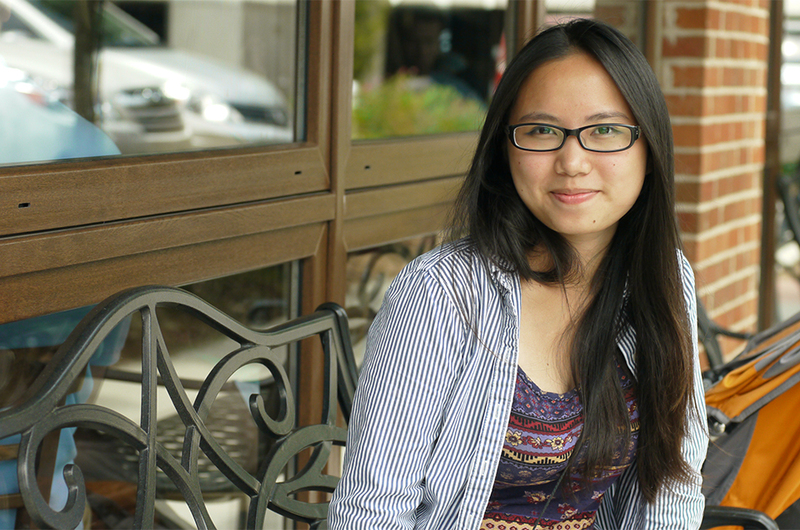 Chuan Fu, a 2013 program graduate, is now our intern for the 2015 spring semester. Currently in her second year at Georgia Perimeter College, she is pursuing a double major in anthropology and film. As part of her film studies, she will be working with Athena's videographer, Suban Dey, to edit and create a short video segment. I am in my second year, double majoring in anthropology and film. I will also most likely minor in French. I chose these two majors because they’re things I have always been compassionate about. Anthropology came about from a fellow AW alum, Jinni, who took an anthropology course and realized that the ideas I have expressed to her were all related to what the field of anthropology looks at. Women’s rights, history, cultural differences, and other current issues—anthropology encompasses all of it and so much more. Film came later; a very enthusiastic film professor during my first semester in college was very encouraging. When he would go into one of his long speeches about how amazing the film industry was, he wouldn’t forget to mention that women will have a very promising future and position in directing the flow of the film industry, starting with us in the present now. Film is also a very powerful medium to getting to people anywhere, anytime. What motivates you to strive for success? Many things motivate me to succeed. Most important is that I don’t want to disappoint myself because my parents have given up a lot for me. Also, my mentors and other important people in my life have striven for me to know my true capabilities and that success for myself is success for them and communities to come. Name something that you are proud of yourself for doing. I am proud that I have stayed true to myself. Though I might not have always understood myself or learnt how to best represent myself, I’ve always known who I was inside. Through all the weird, worldly things of my first few years in America to all the bullying and teasing in middle school to all the harsh preconceptions and lessons of high school, I have learnt that sticking with myself and who I am has always been the greatest answer. Even now, as I navigate the countless push and pulls of college and young adult life, I will always know that I am who I am. Name some women you admire and why. Many women I admire, yet one that really comes to mind is my mother. Coming to America with only my older sister and I, she moved away from the suburban home of my relatives to Atlanta, away from my sister and I, to work hard daily in a supermarket so she can one day save up enough money to provide for us herself. Speaking no English, she learnt everything by herself and even continues to do so now. What is your advice to young women? YOU CAN DO IT! You really can. I understand how fearful achieving your goals can be, but after the fear, there is also excitement. Nobody says it’ll be easy and fast to achieve anything, but every successful woman starts out where you are, and they succeed because they didn’t listen to their fears. Fears that say they aren’t as good as men or they aren’t capable of getting all they want. You push on, even when society says that you can't achieve your goals. You still go ahead and make that goal, because that’s how history is written. In five years, I will be fresh out of college for one year or two. That is all that is really solid because I know my life takes unexpected turns! I will hopefully either be traveling the world, learning many different things that will influence me greatly or starting graduate school, hopefully also out of the country. I want to tackle many issues that affect the worldwide community in either of my paths. Why do you support Athena's Warehouse? I support AW because it has truly helped me become the woman I am today. It was during the AW workshops during my senior year that really made me understand what being a woman meant and unearthed the empowerment that I received from other AW girls. I don’t think girls really had a chance to understand their position as a woman. Everyone always told them that they have to be this or that or they wouldn’t be appealing as a woman, but if they’re lucky, they get a little light that tells them something different. AW was that light for me. It opened up my eyes, so I can see what nobody else has shown me before: feminism.